Chemistry is an important part of any winning team, but it doesn’t have to take long to develop. Take, for example, the winning team from the 2018 undergraduate Dragon Datathon: they met for the first time on the morning of the competition. Team “Datapocalypse” – comprised of Jonathan Corbin, a pre-junior majoring in MIS and business analytics; Adam Yormark, a junior business and engineering major; Sijie Li, a senior marketing and business analytics major; and Blerta Hima, a senior finance and business analytics major – took first place out of four teams in the annual competition sponsored by the Business Analytics Solutions Center. Students could sign up for the Datathon as teams or individually; individuals, like the members of “Datapocalypse,” were grouped at random. Each team was given datasets of customer reviews from several streaming music services – Amazon Music, Pandora and Spotify. With just dates and text, teams were charged with making recommendations for how those businesses could improve their offerings. Corbin and Yormark drew on their preferred programming languages – R for Yormark, and Python for Corbin – to conduct “sentiment analysis,” splitting up positive and negative reactions. Li and Hima dug into gathering outside data – market themes, trends and consumer demographics – to help support their recommendations and the overall group presentation. Corbin is currently taking the Introduction to Business Analytics course and building on initial experience with analytics from his co-op with Kroll, a risk management consulting firm, where he worked on using data to automate processes. “The opportunities are really endless,” he says. 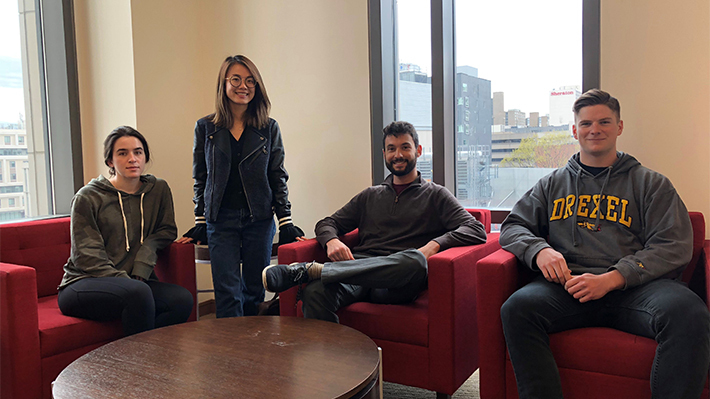 The LeBow Business Analytics Solutions Center’s 2018 Dragon Datathon tasked teams of graduate students with creating advanced analytical models to run a chatbot. LeBow’s MS in Business Analytics hosted its first Datathon, a challenge for student to complete analytics projects using open-source datasets. After winning first place at the L’Oreal Brandstorm Case Competition, a team of undergraduates represented Drexel and the U.S. at the finals in Paris.